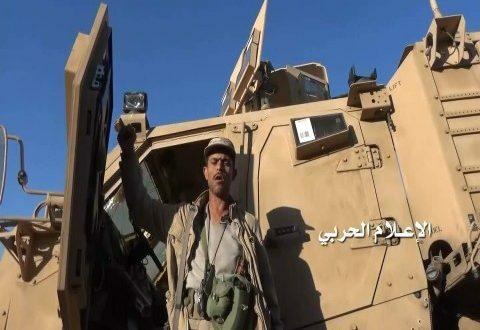 The Yemeni army and popular committees targeted a Saudi military vehicle today in the site of Al Masyal in Asir, leading to its complete destruction. Yemeni forces successfully demolished a Saudi military vehicle in Masyal site, Asir, military source confirms. On the other hand, the artillery force aimed at Saudi sites in Al Shabakah, Sawdna village and Madrasah Khawba. Moreover, the Yemeni missile force launched Katyusha missiles on Saudi soldier groupings and their military vehicles, southern Najran, as well as Saudi Sudaiss site, achieving direct hits. These military operations function as a response to the constant war crimes committed by the US-backed Saudi coalition against Yemeni civilians.